A new U.S. PIRG report names names. The Katy Freeway outside Houston, in 2013. When Texas expanded the Katy Freeway in Houston a few years back, the expectation was that making the massive road even wider would relieve traffic. Some $2.8 billion later, the 26-lane interstate laid claim to being the “world's widest freeway”—but the drivers who commuted along it every day were no better off. More lanes simply invited more cars, and by 2014, morning and evening travel times had increased by 30 and 55 percent, respectively, over 2011. America does not have the luxury of wasting tens of billions of dollars on new highways of questionable value. State and federal decision-makers should reevaluate the need for the projects profiled in this report and others that no longer make sense in an era of changing transportation needs. There are plenty of powerful trends to back this position. The Highway Trust Fund and can’t sustain current spending levels. Driving trends across the U.S. have plateaued. Climate concerns demand prioritizing projects that reduce vehicle miles. The connection between road expansion and economic development, once taken as a given, seems more and more tenuous—with little opportunity for new access in mature corridors, and lesser need for travel in the digital age. The case is bolstered by the fact that there’s a natural outlet for all that highway expansion money: road maintenance, which everyone agrees is vital and urgent, especially for America’s crumbling bridges. There are also far better ways to handle congestion—namely, setting a price for traffic during the peak periods. The point is not so much that no new road should ever be built, but that highway expansion should be a last resort instead of the immediate instinct. The report is worth a full read, but here’s a taste of the 12 projects it spotlights. This project is part of a 30-year, $100 billion plan transportation package designed to improve many travel modes across the state. But while traffic in the metro New York region is obviously awful, experts have been saying for years that expanding I-95 isn’t the answer—something one Connecticut state planner echoed in October: “You can’t build your way out of congestion.” A better focus is improving Metro North rail service in the corridor or charging road fees during rush-hour (which could be reinvested in the system). Plans to build an interstate bypass near Tampa were approved back in 1996, but owing in part to local opposition they never materialized. That changed in May 2015, when the project was bundled into a larger interstate project known as the I-4 “Ultimate” expansion. Inglis and Olivieri note that the Tampa city council voted against the express lanes in June, but the state has subsequently given clear signs that the plans are moving forward. 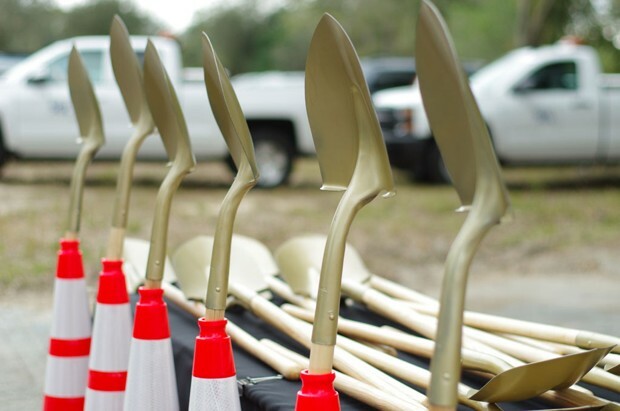 Shovels are lined up for a groundbreaking of Florida’s I-4 “Ultimate” highway. This planned four-lane toll road near Austin, Texas, is not only likely to draw more traffic to a congested corridor but raises significant environmental and public health concerns. Case in point, via Inglis and Olivieri: “nearly all of the road’s planned route crosses above the Edwards Aquifer, which provides drinking water for 2 million Texans.” As an alternative outlet for the funding, they point to 21 “structurally deficient” bridges located throughout the region. This Los Angeles County highway link, tossed around for half a century, got new life with a local long-term funding measure in 2008. Officials studied four project options for the corridor: including BRT, light rail, and a potentially double-decker freeway tunnel (the most expensive option). * The tunnel would seemingly violate the state’s emerging mandate against projects that increase vehicle miles, and a five-city alliance is calling for a new report examining the options. The I-70 viaduct that cuts through Denver and dates back to 1964 clearly needs an overhaul: despite heavy repairs in 1997, the bridge is considered “structurally deficient” and it’s time has come. But local officials also plan to use the viaduct reconstruction to widen the highway from eight to 10 lanes. An expert review panel raised concerns that outdated traffic models informed that decision, and the project also raises environmental justice concerns given its location in a disadvantaged area. 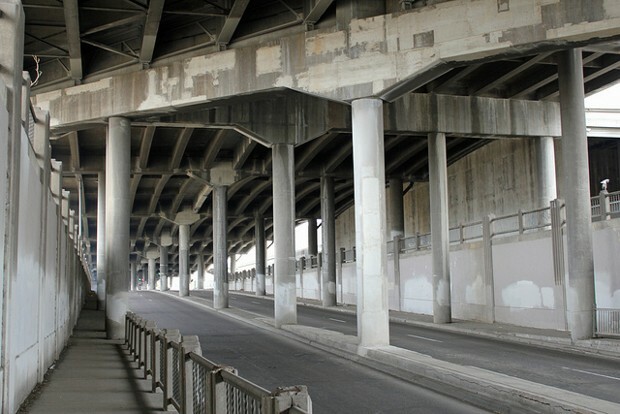 A view beneath the I-70 viaduct in Denver in 2011. This express lane project represents a public-private partnership, with a company called Mobility Partners managing the new priced lanes. But the 50-year deal leaves a lot to be desired, according to Inglis and Olivieri. As is the case with many flawed PPP contracts, the state has to compensate the company for any other projects in the region that could potentially divert traffic from the road and thus drain toll revenue—including more free lanes or expanded transit options. The gateway plan would expand two state roads between Seattle and Tacoma (though a component to expand I-5 is “no longer being considered,” according to the state DOT). * But Inglis and Olivieri question its value from a traffic perspective—pointing out that “traffic on routes 167 and 509 remained stagnant between 2003 and 2014.” Instead they suggest repairing all of the state’s deficient bridges at a cost of $1.2 billion, which would even leave some money left over for other projects. In April 2015, Texas opened a six-lane, six-mile tolled expansion of S.H. 249. Now the state wants to extend the project another 30 miles in two phases. Officials justify the new corridor as necessary given population growth, but Inglis and Olivieri counter that its traffic projection relied on outdated trends and that this area already suffers from air quality concerns. They also note that officials failed to truly consider alternatives to a road expansion. This project would widen U.S. 20 from two to four lanes over a 40-mile stretch of rural territory. The spending would seem to violate a new contract with voters who agreed to increase their gas taxes in 2015 provided the money went toward “critical road and bridge construction projects that significantly extend the life of such assets.” Despite that mandate, Inglis and Olivieri write that three-quarters of the funding pile is going toward highway maintenance instead of expansion, with U.S. 20 widening leading the way. 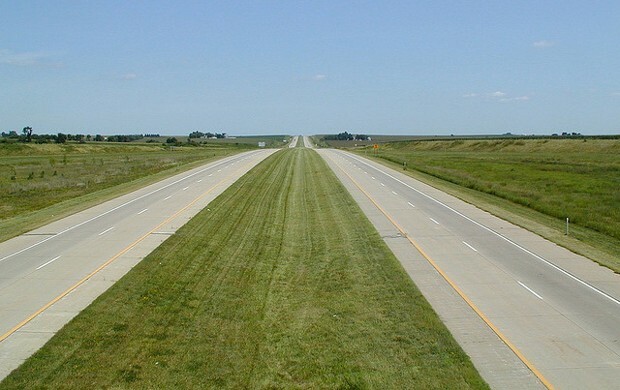 U.S. 20 in Iowa on a congested day in 2000. Paseo del Volcan would build a new road on the outskirts of Albuquerque as a conduit for a sprawling residential development called Santolina, according to Inglis and Olivieri. “That project has drawn significant criticism from residents concerned about how much water the project would require,” they write. The plan seems to be preferred over a cheaper effort to upgrade the existing road network. Inglis and Olivieri say this 16-mile, four-lane highway scored “near the bottom” of the state’s priority list. Yet in June 2015, preliminary work began. The project’s potential impact on traffic is questionable at best: average annual vehicle miles in the county fell from 2004 to 2014, and officials claim “no transportation outcomes or benefits, apart from allowing drivers to avoid several traffic lights,” according to the boondoggle report. Original plans for this new highway, which had it connecting into downtown Pittsburgh, were scaled back out of concerns over social and environmental damage. That’s great for the city, but it means the expressway itself offers transportation access “little better than that which existed before the project,” write Inglis and Olivieri. Meanwhile Pennsylvania has more than 5,000 deficient bridges, with the second-highest percentage of poor spans in the U.S.
*Corrections: A previous version of this article said that officials had chosen the tunnel option for S.R. 710 in California; it is just one of the alternatives being considered. A previous version also focused on the I-5 express lane component of the Puget Sound Gateway instead of on the expansion of state routes; changes to the interstate are no longer being considered, according to the Washington DOT project website. Déjà vu! Is Transit for You?